With the great weekend weather, let’s get you out of your neighborhood rut and exploring the neighborhoods you’ve heard of but for some particular reason haven’t made it to. And bless WeLoveDC alum, Shannon, for doing the hard work for you with her Where We Live series. Did you know Takoma Park got its start back in 1883 as a commuter rail suburb of Washington? Me neither! There’s so much more to this awesome, quaint hood. So hop on metro and check it out in Where We Live: Takoma Park. In my weekly Sunday jaunts to the Palisades Farmers market I have some to love the neighborhood, and you’ll understand why with Where We Live: The Palisades. If you think U Street has changed, then check Where We Live: H Street from 2009 for a complete blast from the past on this transformed DC neighborhood. Generally speaking, I try to avoid the West End because, cough college students, but it’s rich with history, intrigue and non-college shenanigan awesomeness, Where We Live: West End. have someone that would like to talk to us about what it’s like to live there. We’ve profiled 21 District neighborhoods, 7 Virginia neighborhoods, and 4 Maryland neighborhoods already, so check out what we’ve covered so far. If your neighborhood hasn’t been covered and you want to talk to me about where you live, leave a comment here and I’ll get in touch with you. Thanks! College Park is best known for the University of Maryland and its 36,000 students, but there is so much more to this community than just the university. College Park is full of great restaurants, shops, running trails, arts and cultural opportunities, sporting events, and more. Sure, it’s got a lot of students, but it’s not just riots and frat parties. 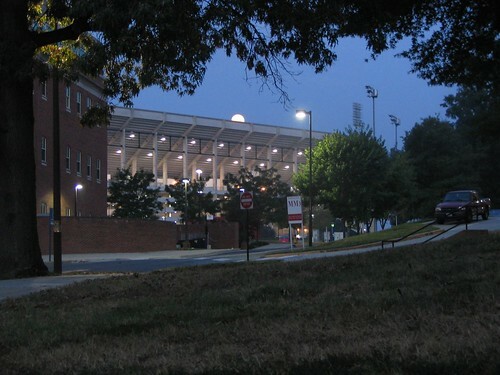 And since I’ve mostly only seen the riot/frat party side of College Park while visiting friends who attended the university years ago, I’ve asked our friends at the fantastic planning and development blog Rethink College Park to tell us what’s great about their community outside of UMD. Read on to find out what College Park residents love about their community, and what you’ll have to check out next time you’re in the area. Welcome to another edition of Where We Live. This week we’re focusing on Ballston, the western end of Arlington’s fabulous Rosslyn-Ballston corridor. Ballston offers a great balance between access to Northern Virginia (like Tysons/Fairfax/Farlington) and access to DC, and it’s actually a pretty cool place to live and hang out. History: Ballston was a major crossroads during the eighteenth century, and it was named after the Ball family (whose family cemetery is in the neighborhood). In 1896, the Washington, Arlington, and Falls Church Electric Railroad (a streetcar) was constructed along what is now Fairfax Drive, and the area developed as a streetcar suburb. In 1951 the Parkington Shopping Center opened where the current Ballston Common Mall is, and the area became known as Parkington. The area declined in the 60s and 70s as it was really just a retail-dominated suburb, but Metro came along in 1979 and changed that. Since the opening of the Metro station, the area has continued to redevelop, replacing the suburban sprawl of the 50s and 60s with more compact urban development. Today Ballston is a thriving retail, office, and residential center. It’s time Where We Live ventured into Maryland. And where better to start than Bethesda, the DC suburb that feels more like a city than many parts of DC. Bethesda is the perfect balance of city life and access to suburbs for its residents, and it has so much to offer that it’s a destination for even downtown DC residents. 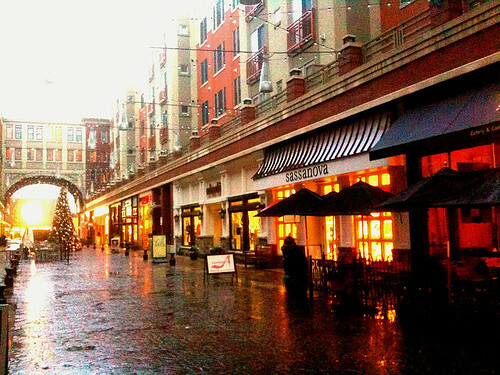 Read on for Bethesda’s best kept secrets and what you should check out next time you’re in the neighborhood. History: Bethesda originally was a small settlement along a trade route that connected to Georgetown. It got its name from Bethesda Meeting House, a church built in 1820. There wasn’t much in Bethesda until the streetcar system connected the neighborhood to DC in the early 1900s. The streetcar encouraged a boom in suburban development in Bethesda, which continued throughout the twentieth century. The area got its office boom during World War II, when the NIH and National Naval Medical Center relocated here. Bethesda continued to grow, and in 1984 the Bethesda Metro station opened, which led to even more high-density development and redevelopment. Building on the office and residential concentrations located here, Bethesda has recently defined itself as a retail destination and lifestyle center with projects like Bethesda Row. After profiling 22 neighborhoods in the District, it’s time Where We Live headed out to the suburbs. 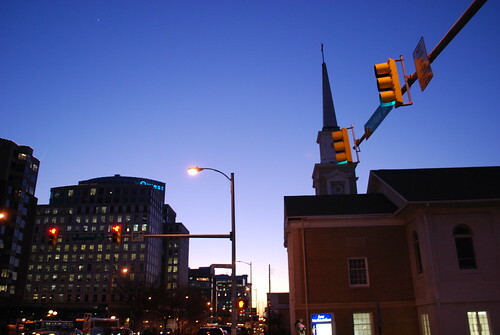 This week we’re focusing on Court House, an urban neighborhood in the middle of Arlington’s Rosslyn-Ballston corridor. Sure, it’s technically a ‘suburb’, but with a movie theater, multiple grocery stores, tons of bars and restaurants, and office and government buildings, Court House has more to offer than many neighborhoods in the heart of DC. History: In 1791, this area used to be part of DC. But Virginia wanted Alexandria County back (mostly due to the sad fact that Alexandria was a big slave port, and talk of abolishing slavery in DC had Virginia scared), and this land was retroceded in 1846. Fort Woodbury was a Civil War fort built in 1861 that stood where the current courthouse stands. 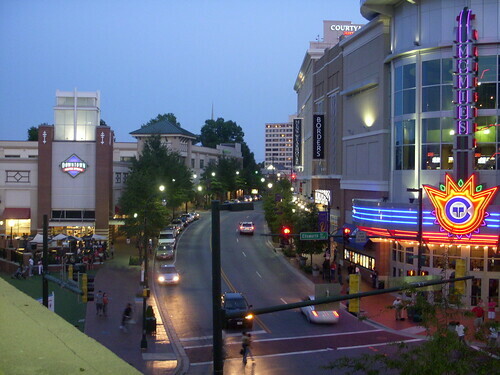 In 1852 the City of Alexandria split off, and in 1920 this area was renamed as Arlington County. Welcome back to Where We Live, your bi-weekly tour of the District’s neighborhoods. This week the focus is Near Southeast, which is also commonly known as Navy Yard or Capitol Riverfront. This neighborhood has been completely transformed over the past several years, and the construction of the Nationals Stadium has redefined the character of the area. Read on to learn how the area has changed, what’s worth checking out when you’re in the area, and where to see some amazing before-and-after photos. History: Pierre L’Enfant came along in 1791 and recognized that Washington’s waterfront retail would be its most valuable asset, and located its commercial center in this area. Then, in 1799, the Navy Yard opened (which happens to be the longest continually-operated Federal facility), and became a major shipbuilding center. This area was the heart of Washington throughout the 1800s, and the wharf was one of the most lively parts of the city. 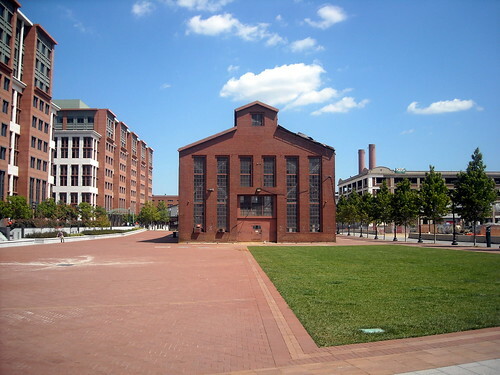 During wartime, the Navy Yard became even more important– it was a key defense of the city during the War of 1812, and during the 1940s, the Navy Yard reached its peak of 26,000 employees (by this point, it wasn’t shipbuilding but production of weapons ammunition that kept the Navy Yard so busy). But all this production led to one very polluted river. And I-395 cut through the urban fabric of the neighborhood. After the war, the Navy Yard drastically scaled back operations– by that point, the commercial heart of the city had moved downtown. So Near Southeast was left with a polluted river, a terribly ugly highway overpass, and lots of abandoned buildings. It’s no surprise that this combination of factors led to crime, disinvestment, and neglect of buildings. Hi, and welcome to another edition of Where We Live. This week, we’ll be looking at a DC neighborhood that is older than DC– Georgetown! Home to beautiful architecture, a thriving commercial district, and a major university, Georgetown probably draws more out-of-towners than any other DC neighborhood (except maybe Adams Morgan on Saturday nights). 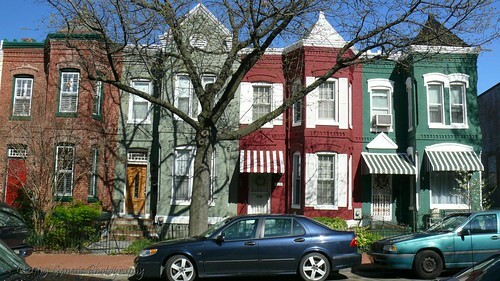 Read on to find out what real Georgetown residents think of their neighborhood. History: Lots of history to cover here. Way back in 1632, an English fur trader documented a Native American settlement called Tohoga where Georgetown currently is, and he established trade there. Fast forward to 1751 when the town was incorporated as part of Maryland (interestingly enough, it’s not named after George Washington as I had erroneously assumed– it’s either named after King George II or its founders, George Gordon and George Beall). Because of its geographic location as the furthest point up on the Potomac River that boats could reach, it became a big port, and warehouses and buildings grew around the tobacco trade (and sadly, the slave trade too). When Congress created the District of Columbia in 1791, Georgetown was included in the outline of the 10-mile square. Georgetown continued to grow, with Georgetown University founded in 1789, and much of the area developed with commercial buildings near the water and residential buildings further north on higher ground. Georgetown retained its identity for quite a while– that is, until its town charter was revoked in 1871, and when it was finally ordered in 1880 to conform with DC’s street naming structure. Another Friday, another neighborhood. This week’s Where We Live focuses on a neighborhood that has reinvented itself over the past ten years, Columbia Heights. Columbia Heights has a lot to offer, from beautiful residential areas to the massive new DC USA development, and it’s got a pretty neat history too. 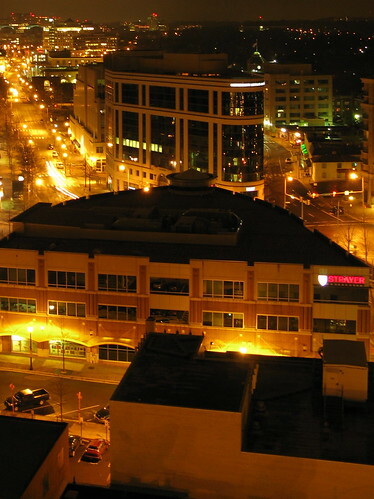 Read on to learn all about Columbia Heights. History: Columbia Heights was originally a horse track and farmland directly outside the boundary of the City of Washington, and it was also the original home of Columbian College (which eventually became George Washington University). In 1881, Senator John Sherman purchased a whole bunch of land in the area and named the development Columbia Heights, in honor of Columbian College. In 1904, the college moved down to Foggy Bottom. 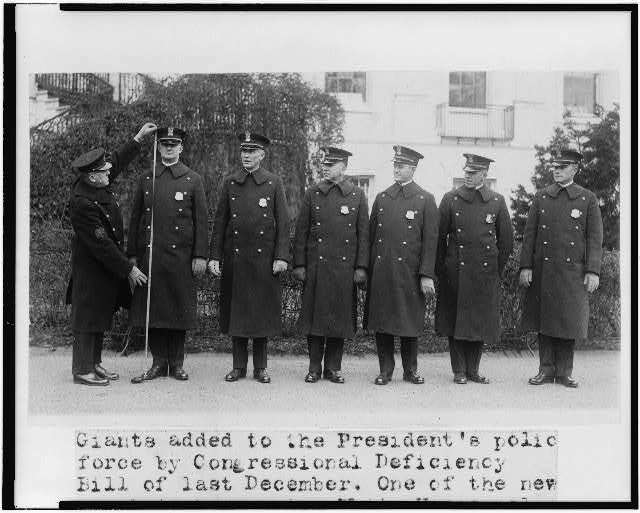 The federal government purchased some land and built Meridian Hill Park, and the area became an upscale neighborhood that attracted federal workers and military officers. In the early 1900s Columbia Heights was one of the most desirable neighborhoods in the city, and attracted a number of notable residents. By 1914, four streetcar lines connected Columbia Heights to downtown DC. The neighborhood began to transform from a suburban neighborhood to an urban center in the early part of the twentieth century, with the construction of larger apartment buildings and the Tivoli Theater in 1924. 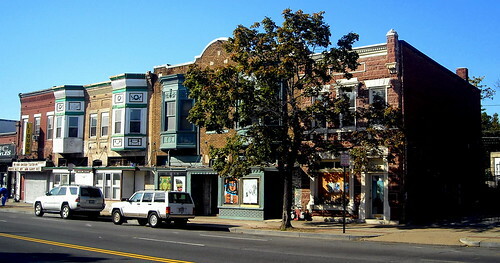 Columbia Heights was adjacent to the thriving black communities of Shaw and U Street, and became home to more African Americans during the first half of the twentieth century. Then, of course, the 1968 riots happened. Residents moved out, stores remained vacant for decades, and Columbia Heights lost its luster. Welcome to another edition of Where We Live. This week we’ll be looking at a whole section of the city that is rapidly changing: the section of Northeast DC north of Massachusetts Avenue and south of Florida Avenue. This area has a LOT of different names: Near Northeast, H Street, the Atlas District, NoMa (for NOrth of Massachusetts Ave), North Capitol Hill, and the list goes on. This part of town is known for the new office buildings in NoMa, the retail/theater/restaurant district on H Street NE, and the quiet, residential neighborhoods that surround them. History: Florida Avenue was once called Boundary Avenue, and was the northernmost boundary of Pierre L’Enfant’s plan for Washington, so this area was part of the original City of Washington. H Street NE has been the site of major transportation milestones in the history of the city: the Bladensburg Turnpike was a tollgate and entrance to the city, the Baltimore and Ohio railroad was constructed in 1835 and the proximity to Union Station transformed this area, in 1849 H Street itself was built, and the H Street Streetcar was opened in 1872. The streetcar spurred a great deal of development in the area, and streetcars were running along the corridor until 1949. Throughout the 1900s the area was a major commercial hub of Washington, with department stores, theaters, and restaurants lining H Street. However, the riots in 1968 following Martin Luther King’s assassination devastated the neighborhood, and many businesses, theaters, and restaurants moved out to the suburbs. On H Street, the suburban-style, car-oriented development created pedestrian-unfriendly environment, and the lack of a nearby Metro station meant that the area remained a car-focused corridor. However, in the last several years, the area has seen a resurgence in development. It is now home to a thriving theater scene, a variety of restaurants, and a growing number of shops. It is once again becoming a pedestrian-friendly district, and with plans of a streetcar in the future, it may one day regain its status as DC’s main commercial district. Next door, NoMa is also rapidly changing from an old warehouse district to a major employment center with over 1,000 hotel rooms, 8,000 residential units, a new grocery store, and new restaurants and shops. This week we’ll be looking at the Capitol Hill neighborhood. This neighborhood could probably be called the largest in DC, since essentially anything east of the Capitol, north/west of the Anacostia River, and south of Union Station is generally known as Capitol Hill. 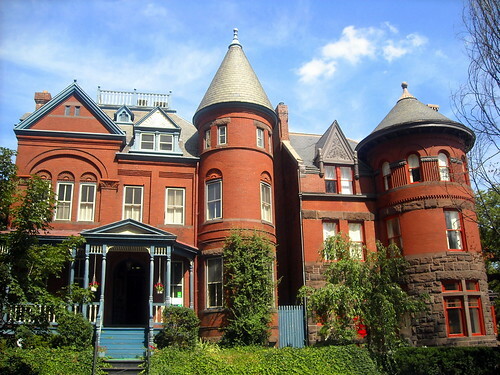 The area is home to so many great places, from Eastern Market to Barracks Row to Union Station, and it also has some of the best historic architecture in the city. History: The hill that the Capitol sits on was originally called Jenkins Hill (or was it?). Pierre L’Enfant decided that it would be a good location for the “Congress House”, and before you knew it, it became the center of residential development in our fair city. Because it was so close to the Capitol, congressmen lived in Capitol Hill boarding houses, and because it was so close to the Navy Yard, it was also home to craftsmen and laborers. The neighborhood continued to grow throughout the nineteenth century, and many historic rowhouses in the area date from this era. It was mostly a mixed-income neighborhood for the nineteenth and early twentieth centuries. However, the fringes of Capitol Hill were hit hard by drugs in the 1980s, and as recently as 2000 crime was out of control in Hill East (if you get a chance, check out Jim Myers’ description of that time in The Atlantic). Most of the area has bounced back, and Capitol Hill is now the city’s largest historic district and one of the city’s greatest neighborhoods. 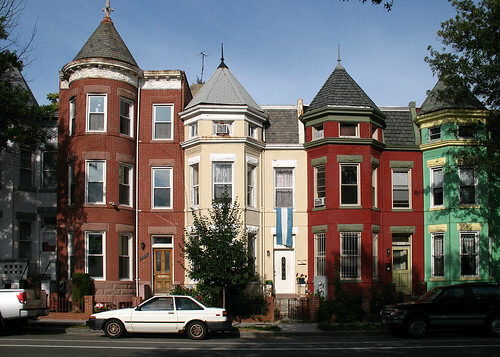 Neighborhood Character: The neighborhood is certainly one of the District’s most diverse. You’ve got empty-nesters, long-time residents, recent college grads, families with small children, and Hill staffers all mixed together in a few square miles. Hill East resident Shaun says, “My fiance and I live in a condo that’s home to Georgetown law students, Hill staffers and a retired woman who’s lived at our intersection for so long, she remembers when the new condo around the corner was a crack house.” Historic rowhouses make up the majority of the housing in the area, with a few apartment buildings and condominiums throughout the area. 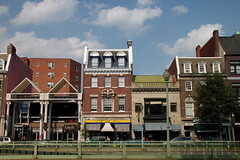 Commercial development is mostly located along Pennsylvania Avenue, 8th Street SE (Barracks Row), and around Metro stations. The area is quite pleasant to walk around, with brick sidewalks and mature trees and beautiful views of the Capitol. Newseum: Worth $22 per Ticket?